We arrived at our bed and breakfast a bit too late for lunch. Simona, the delightful owner of the Dante B&B, suggested that we stop down at the Leon d’Oro restaurant & pizzeria to make our dinner reservation as it books up quickly for the evening. Even though it was almost 4 pm there were still a few people finishing lunch. Owners, Antonio (Tonino) and Salvatore were at the restaurant. As Tonino saw that I was curious to have a look around the restaurant he invited us to come in. When I peeked into the kitchen from afar he grabbed my hand and took me into the kitchen. There, the very shy Salvatore and his kitchen help, were at work to prepare for the evening service. Salvatore was making eggplant parmesan and I made a mental note to order it for dinner. Tonino is the kind of Neapolitan restaurant owner I love. He’s so welcoming you feel like you’ve been friends for years, anxious to show you every corner of the restaurant and share every detail of the manicaretti (tasty delicacies) they prepare daily. The interior of the half century old Leon d’Oro Restaurant is simple and brightly lit, with checked table cloths and simple decor. The pizza oven flanks the kitchen and one of the dining areas. We didn’t try the pizza as we had already decided on other dishes. When a soccer game is on the waiters have half an eye on the game, but still manage to take good care of the customers. And if Naples is playing, well….. 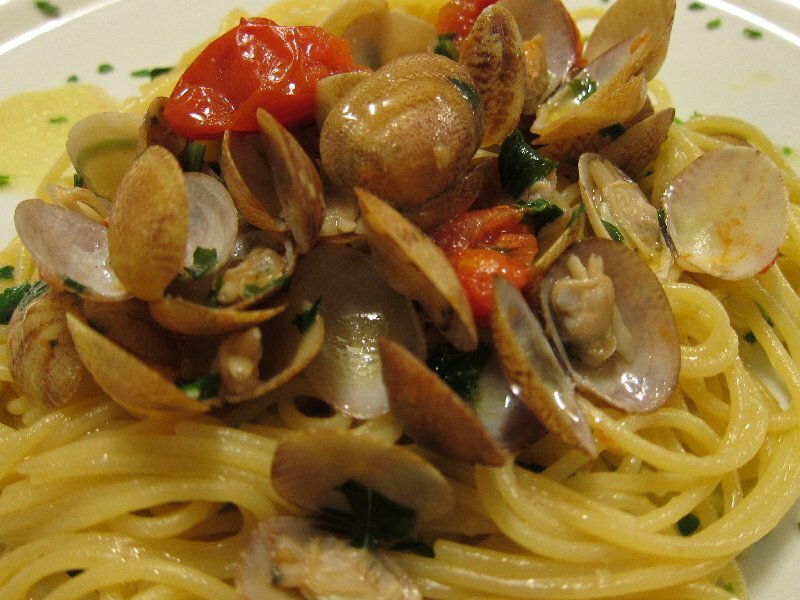 Seafood abounds in Naples. We’d seen some scrumptious looking fresh clams at the market earlier in the day so that was an easy and obvious first choice. We ordered the eggplant parmesan after our pasta. 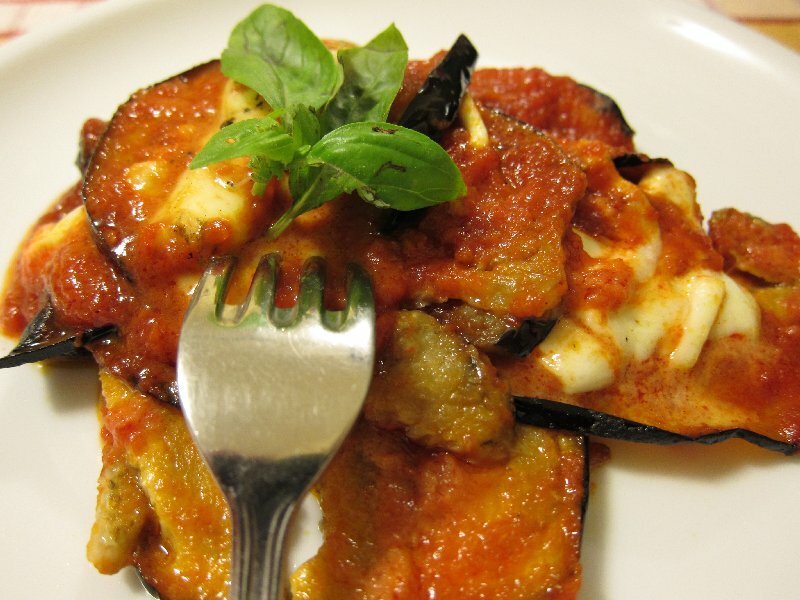 The eggplant was cooked to perfection with just the right amount of fresh buffalo mozzarella & provolone cheese and a delicate tomato sauce. 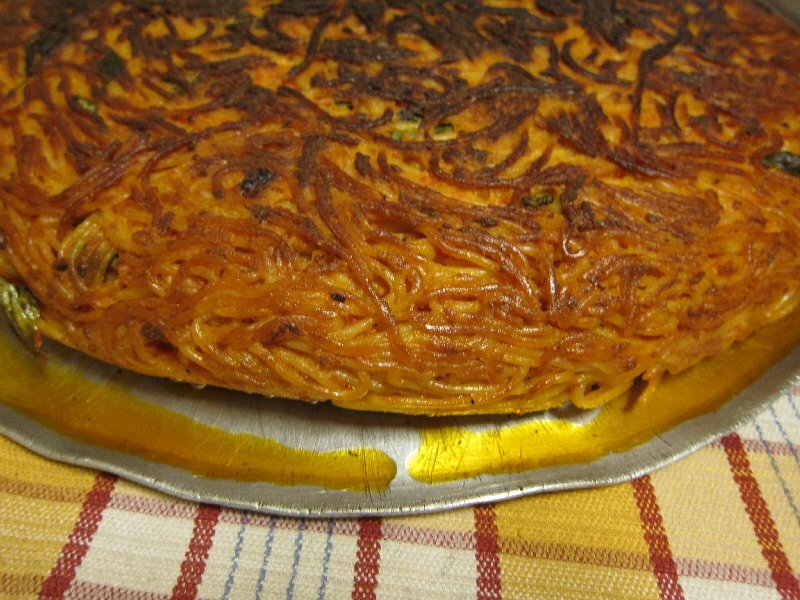 A typical Neapolitan dish is the frittata: spaghetti, eggs, tomato sauce and parmesan or pecorino cheese pan fried in a large, deep frying pan and served sliced. Tonino brought it out of the oven just as we were finishing our eggplant and served us a slice to try: such a simple dish but wonderfully flavorful. .Based on our experience the first night we decided to have our final lunch at Leon d’Oro Restaurant. Tonino was clearly pleased to see us again. We had a chard and bean soup and pasta genovese. Genovese is a slow cooked ragu’, frequently made from pork. 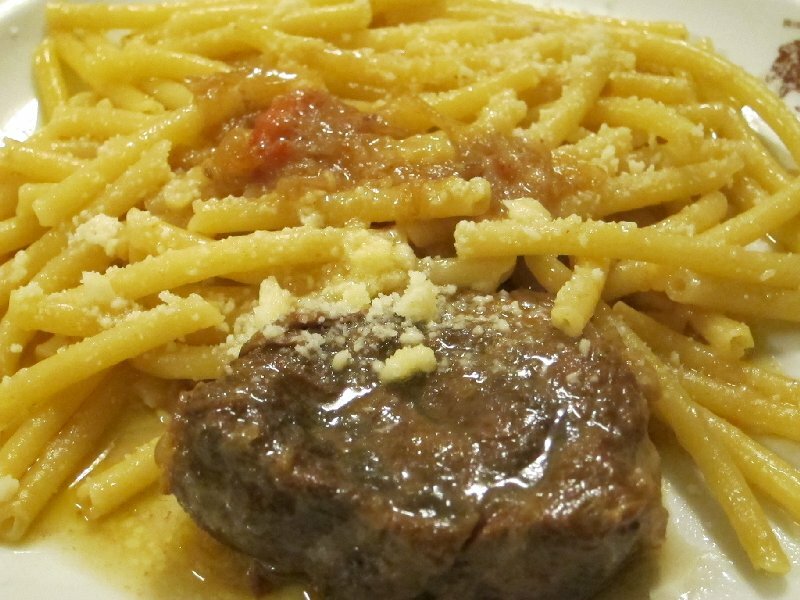 It’s cooked for hours with olive oil, tomatoes and lots of onions and then served with a short-cut bucatini. Often the meat is broken up into pieces or, as in this case, served as one piece. We finished with mandarini and freshly made graffette. 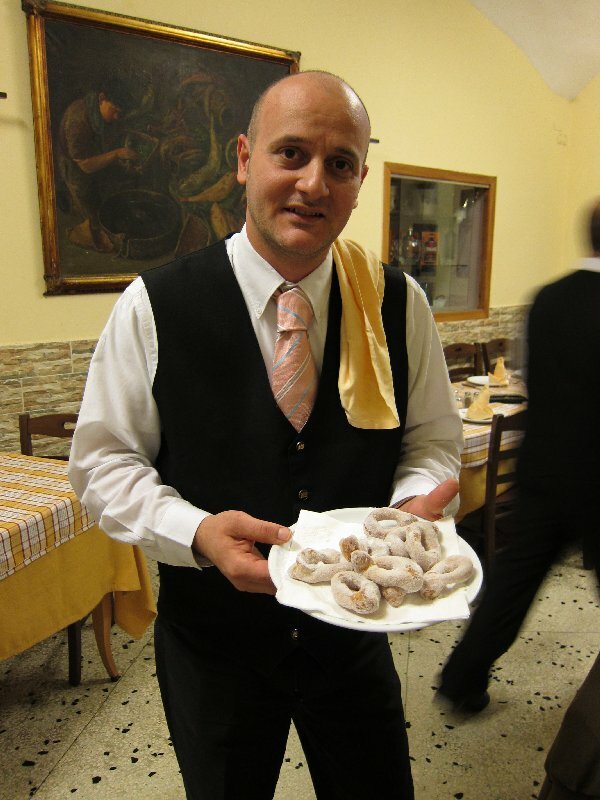 Graffette are a sugar-coated donut-like dessert made with almost equal parts potatoes and flour, served by our affable waiter Giuseppe. We left Naples with a freshly baked loaf of bread in hand to take back to Rome. Tonino invited us to return to Leon d’Oro Restaurant to cook with Salvatore. In Naples these are not just pleasantries but solid invitations. Although Naples can be crazy and disorderly, Neapolitans are some of the warmest, most genuine people you’ll ever encounter. 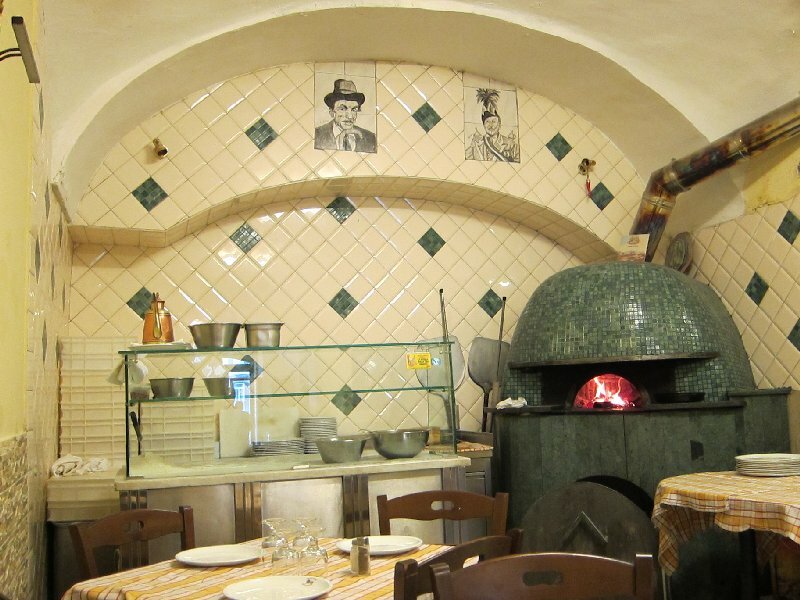 Our favourite restaurant in Napoli… the spaghetti frittata is heaven. We enjoyed it so much the first time we went back the next day. You are making me sooooo homesick for Italy. I know! The spaghetti frittata is amazing, as are the parmigiana and the graffette! Will return soon! It all looks SO good! Unbelievably, after all our time in Italy, we seem to have by-passed Naples……..a shame.